POINT LINE PLANE began as a synth/drums duo creating noise music with pop hooks and touring the US relentlessly. As electro continued to fizzle and screamy dance-punk/neo-no wave enjoyed a brief spike of popularity, kids and college radio DJ's took note of Point Line Plane's eclectic and original style, often contrasting the sound to other innovators like LIARS, EX MODELS, and LIGHTNING BOLT. Actual comparisons were hard to draw however; and reviews in print and online found writers grasping for metaphors rather than listing influences. In two short years, Point Line Plane played over 100 shows and continued to hone their near-telepathic live skills in destructively short 20-minute concert performances. The production of the self-titled album and their subsequent score for the feature documentary film "Haunters" made it clear that their studio abilities were unquestionable as well. Point Line Plane's sophomore effort and Skin Graft Records debut, Smoke Signals, tackles failed communication in all forms. 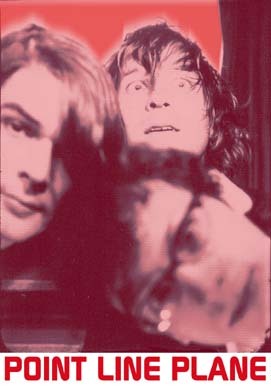 In late 2003, the original synth/drums duo of Joshua Blanchard (ex-Sensualists) and Nathan Carson (ex-Witch Mountain) were joined by Howard Gillam (aka Supersprite) on second synth. While the addition of a third member could have created a wall of sound throughout, the album is more often reflective of restraint, tension, and drama. The ingredients of Smoke Signals; repetition, hypnosis, psychedelia, paranoia and darkness; all combine to form an album that will satisfy extreme noise enthusiasts with its sonic textures - while finding favor abroad with it's classic songwriting. "The music found on this debut is something that will surely grow, expand, and continue to explode on upcoming releases. But, even so, this first recording is an original work that defies the amount of sound a couple of guys can produce, as it binds searing synths and brain jarring beats with the glue of manic energy. Prepare for your feet to dance and your head to explode." Northwest duo Point Line Plane rock the darkwave vein hard for fellas who come armed with only a drum kit and a synth. The year-old Portland, Ore., unit keep things chilly and menacing and kind of raw and unhinged at the same time Ð picture an angsty Hella or threadbare Trans Am hooked on Sisters of Mercy or Red Lorry Yellow Lorry. Singer-keyboardist Josh Blanchard rags on subjects such as art, trapped feelings, and disco, while Witch Mountain member Nathan Carson tries his darndest to sound like a drum machine. "Point Line Plane's self-titled debut is aggro keyboard-core of the highest and most demented order." ÐTerrorizer Vocalist Josh Blanchard conjures, at turns, a pill-popping poofter circa 1982 and a slavering, gravel-crusted hellhound. Either way, his voice is riveting, and the music -- crashing, funereal organs, electric warbles, atonal repetition, storms of cymbals, and relentless, rattling bass drums -- falls together with an eerie precision found only in great pop songs. This might be how PiL would have sounded had the organist Quintron been on board. "Point Line Plane are a duo from Portland, Oregon who do a very nice job of crafting anarcho-power wobble with just a synth and a drum and throat. Their new single, "Curse Chorus Curse/Sh...Boom," is sonically located somewhere between Suicide and the current crop of No Wave/New Wave artfop engineers. They manage to come up with something that is evil and edgy, while being very stupid at the same time. This is a pretty hip trick, since most of their brethren go for either one of these modes or the other. And truly, variety is the variety of life; so the more faces they wear the merrier we listeners ought to be. Good stuff." POINT LINE PLANE "CurseChorusCurse" 7"